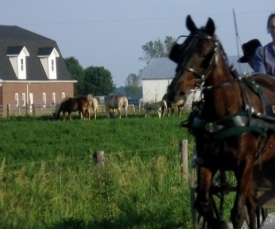 When you visit Amish communities, can you pick out the Amish homes? As a general rule, the more conservative the community, the easier it is to tell the Amish dwellings from the English. The lack of power lines is one giveaway. So is the style and design. A Swartzentruber Amish farm home has a distinct angular look to it. The (often rusting) metal roof, peeling white paint, and companion windmill are also sure-fire signs of a Swartzentruber abode. In more progressive places like Lancaster and Holmes County, it’s not always so clear. Some Amish dwellings blur the line between modern and plain. Over my years selling books to the Amish, I visited a few thousand Amish homes. I got to be pretty good at picking out the Amish from the English. I could tell differences in style between affiliations and communities. But I recall being confused on more than one occasion. Among the Amish, you sometimes find homes extravagant even by English standards. I remember visiting what I would call a near-mansion, secluded off the main road, in Holmes County. The owner was Amish and the home itself was technically “Plain”, but the elaborate stonework, imposing size, and unorthodox design all told a different story. I’ve sat inside log cabin homes in places like northern Indiana and Arthur, Illinois. “Log cabin” sounds rustic enough. But the frontier connotations mask a certain luxury. Log homes aren’t necessarily cheap or simple to make. Not to mention that as the only one in your church in a log cabin, you’re clearly deviating from community norms. And Amish are acutely aware of these deviations, more than we would be. I’d sometimes hear Amish commenting on their neighbors. A family down the road might be “rich” or live in a “fancy” home. Usually said in good humor, but nonetheless indicating family XYZ may be straying a bit off the reservation. There was an interesting piece on Amish architecture (Updated: no longer online) yesterday in the Fort Wayne Journal Gazette. Michael Galbraith examined 700 Indiana Amish homes over three years, pinpointing differences between communities and groups. One community he examines is the sizeable Allen County Amish group. As Galbraith found, certain Amish are more lenient when it comes to styles and materials. The prototype Amish home exterior is white-painted wood or siding. But as Galbraith discovered, many Allen County Amish now build with brick. Having visited most of the Allen County homes, I’d say brick construction is pretty widespread in that community. Some of those who don’t build with brick hang faux-brick siding instead. It’s striking because Allen County people are not the most “worldly”, in at least one sense. Frankly, they are probably about the–let’s just say “prickliest”–Amish you’ll meet (at least at first, and not everyone, of course). I generally found them among the most difficult to approach and speak to. So they are not really keyed-in to us fancy outsiders in that regard. But they do live in some pretty fancy-looking homes. Again, not all of them, and some even still use outhouses. But look at a typical Allen County brick home and you don’t immediately think “Amish”. Are Amish leaving Plain homes behind? I think some are. Part of this comes from Amish having more money due to business and higher-paying occupations. Also, many Amish work in construction. They are intimately familiar with the trade. They develop an appreciation for certain styles, materials, and for work well done. It’s often the contractors who have the fancier homes. Not surprising, when you think about it. The insides of homes change as well. Amish homes have a typical interior appearance. Durable linoleum floors, light colors, limited decoration, and wide open spaces (brighter, and the better to host large groups) are the norm. But with money and “worldly” exposure, interiors have deviated as well. For instance, Amish have adopted more in-home decor, like decorative trinkets and wall hangings. Interior furnishings have gotten more plush. I’ve sat in Amish kitchens sporting highly elaborate cabinetry. I remember marveling at one spread in the Daviess County, Indiana Amish settlement. I found the intricate woodwork slightly distracting. As with the home exteriors, you see more of this with those that best know and appreciate the craft. A cabinet maker is more likely to have top-notch cabinets in his own home–as long as his church lets him get away with it. Amish or English, our homes reflect who we are. For the Amish, the home is in some sense a sacred space. It’s why they’ve kept invasive technologies–phones and public electricity–out. The home is where children are born, taught, disciplined and reared in the Christian faith. A new generation imbibes crucial cultural values within its walls. And the home is not just the center of family–since Amish don’t construct houses of worship, it’s often the physical location of church itself. A Galbraith points out, Amish change over time. There is still an Amish “norm”, or rather “norms”, specific to community. Amish homes still contrast with their neighbors’ in many ways. They’re still pretty plain, all things considered. But as their homes change, what will that mean for Amish society itself? The Plain houses I have been in have been really, really Plain. My own still has the decor of the previous resident, and since we are not Anabaptist, we have religious pictures and such, but no secular artwork. My guess about the builders and cabinetmakers is that they may construct their own homes and furnishings to showcase their skills. People I have known in the building trades usually build a bigger and more elaborate house for themselves so they can show potential clients what they can do. I think it would be hard for some to resist. Especially when you’ve got to assume that a lot of these guys love what they do. And also considering that a lot of contractors are working in upscale developments. Spending your time doing 6-figure renovation jobs in wealthy homes could alter your perception of what is “Plain”, if just a bit. Contractors may also have ready access to either surplus materials left over from a customer’s job, and they may also get trade discounts from local lumberyards which they use for their personal projects as well. Very interesting article on what is to me a fascinating subject. The variation of architecture of the homes goes along with some of the pictures of the interiors you have published, varying widely based on how much the church allows. The homes we have been in have all been have had very nice woodwork and furniture,as some of their family were involved in cabinet making. They downplayed how nice they were, stating only that a relative had made them, and had done a nice job. They believed that as Christians when they did their work they should always try to do their best. Thanks for sharing this Kevin, not surprising to hear the downplaying. I have no doubt about doing one’s best as Christians. When you look at some of these less-Plain aspects of some Amish homes it’s interesting to wonder what (and how) parameters are placed and how they are interpreted. For example the Illinois log house is certainly different than neighbor’s homes in its church district. It leads me to wonder to what degree if any that was questioned by other members of the church. Some groups of course are going to be much more stringent on this. The Swartzentruber out buildings like the barn and shed must be painted with a mixture of 2 parts red and 1 part black paint. This gives the buildings a very dark red. A few in Wayne County Ohio don’t have their paint mixed just to the perfect 2-1 ratio. Very interesting article. I have not really paid that close attention to style of houses other than to know that most are white, nothing else really occured to me. I will pay more attention when I go to Arthur the next time just to see how good my observation is, LOL. A friend of mine says he knows all the Amish homes around here (Lancaster,York, PA) because they all have dark green window shades – is that true, or is he just generalizing. A lot of the Amish homes are set back from the road and I can’t tell what is at the windows. Just curious….. Yes, green shades are very common in Lancaster County. By the way, some have had problems building because of building codes. Codes require specific electrical requiremens, and the Amish don’t use elctricity. I usually go to Lancaster once a year and the newer homes that the Amish have built are absolutely beautiful. They have the taupe siding and some sort of stone or brick work. The beautiful flowers that are planted around the house sure adds extra beauty also. Alecia I’ve many times been impressed by the landscaping around Amish homes. Amish like all of us appreciate natural beauty and I’d guess even more so, since they de-emphasize artwork and other sources of aesthetic appeal. The garden and flowerbeds are one place where Amish women especially can cultivate that love. Sometimes what they grow even brings in an extra buck or two. Roadside flower stands are particularly common in Lancaster County. Plus a tidy, well-trimmed yard usually means busy kids. In many communities it’s common to see Amish children toting weed-whackers in the summer. Excellent post, Erik! I’m going to have to look more closely at the houses we pass next we go up to Honey Brook and Morgantown PA. I’ve probably been driving past a lot of Amish homes without even realizing it. Another thing young Amish commonly do is to build a shop structure and live in it temporarily until constructing a home. I’ve always thought this to be somehow aligned with ideas like humility and plainness. I’ve also been in some Amish homes where the owners were living in the basement before getting the living quarters up top finished. Again, typically younger families. However Amish in warmer places may move down to the basement during the hot months. I do have one memorable experience from an Amish friend’s trampoline. After a vigorous jumping session with the kids, I dismounted to severe back pain. I guess I rattled something wrong. Had to wear a brace for a week or two. If I was smart I would have told people I blew it out heaving corn or something manly. Still, nothing more fun than a trampoline. I was visiting Old Sturbridge Village a couple weeks ago, when I was thinking about the Amish and architecture — or specifically, paint. Perhaps it’s a carry-over from their part of Europe, I don’t know. While we think of many of the Amish buildings as conservatively painted — the dark red Schwartzentruber barns, or the simple white houses with maybe colored shutters of other communities…paint didn’t become common in New England until the early 1800s. That they chose to paint was a decision the communities made to decorate just a bit, but remaining modest. Even today there’s many old barns still standing that have never been painted — and a few houses you’ll find tucked away along mostly forgotten roads. As long as they had a good roof, the wood siding will last untreated. The rule is you must decide shortly after building — if you paint, you must always keep up with the painting so moisture doesn’t get behind the paint then trapped in by a new coat applied too late; if you don’t paint you must never paint lest you likewise trap the moisture in. It’s not that you’d paint the week you put up a building, especially if using green timber as farmers are apt to use…but once the green timber has naturally dried out after six months or a year or two it’s time to either paint or not. signs to look for why trying to spot Amish homesteads. County, Indiana settlement (progressive Amish) and Orange Co.
Indiana settlement (conservative Swartzentruber) almost every Friday. I go to Daviess County first and then on to Orange Co.
an interesting experience. Has anyone else ever experienced this? Interesting post Erik. Talking of barn painting, some may remember that farmers use to get their barns painted for $1 a year. Only catch was the white-on-black lettering “SEE ROCK CITY” or yellow or black lettering “CHEW MAIL POUCH TOBACCO” advertisement. Although the Amish do grow tobacco, I doubt they would go along with the signage. I don’t remember seeing any Amish in the Orange County area. Is that where West Baden Springs hotel is? Where in that area would you go to find the Schwarzentruber Amish? When I built a house about 20 years ago, an Amish cabinet maker made all of our cabinets. I noticed when we visited with him to make our selections that he had quite fancy fencework and what I call gingerbread all around his home, yard and shop etc. I was surprised to see that. As to the Amish gardens, they are spectacular. When we visit relatives in the northern Indiana area of Shipshewana and Nappanee, I love to go for long rides in the countryside to see the beautiful vegetable and flower gardens. I suspect their flowers are so beautiful because they fertilize with good old horse manure! On the south — Co. Rd. 200 N, on the North — Lawrence Co. Rd. 1035 S.
all know where Petersheims, Stutzmans and Millers are located. contrasts I see in Daviess/Orange Counties, Ind. Orange and Washington County are wonderful places to visit. Thanks for the information on the Orange County businesses. I’ll be sure to check them out the next time I visit that area. When I went to Lancaster for the day last week, I did happen to notice that alot of the new Amish homes are looking mighty similar to some of the ” Englischer ” McMansions! Some are now using colored vinyl siding, like tan, beige, or light sage green, as well as ornamental stone or brick, and of course vinyl windows and railings. And it was a bit of a surprise to see all of the huge, fancy gas grills in the yards along with modern patio furniture on the concrete patio’s or porches. So I say yes, some Amish homes are definately changing and adopting a much more modern look. Indiana Amish were Old Order Amish. I read Al in Ky’s, post stating they are Progressive Amish. Could there be a blend? Jan sounds like a wonderful trip. I’ll be in Indiana next week but not sure if I’ll get to Daviess. I think what Al meant was that the Daviess County Amish are comparatively more progressive–they are still considered Old Order Amish, but compared to more conservative Amish who use more limited technology, we could call them “progressive”. They are still horse-and-buggy, plain clothes, no electric in the house as I’m sure you saw. the name of an Amish subgroup. Interesting comments all around. I happened upon this page looking for information on Amish architecture, specifically how they design their homes because they are designed for large families and we have a large family. Homes today aren’t designed for families like us, so I thought they might have some ideas for me. We live in Allen Co, Indiana and I have seen brick and white. I do have a friend who lives in a gray house. I haven’t looked carefully but I think the barns are white. No shutters on Amish homes. And many Amish are quite wealthy. We have seen some elaborate landscaping too. Some are elaborate campuses! Another indication is the solar panels and generators. They do use electricity–just aren’t dependent on the electric company.